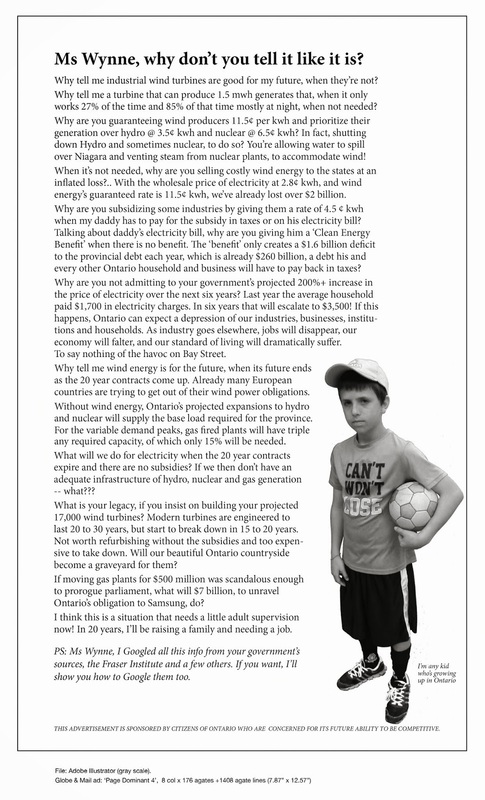 Energy Ripoff | Mothers Against Wind Turbines Inc.
“…We called the legislature back immediately after taking office, because we believed there were too many urgent priorities to wait until the fall. Many of these priorities touch on the work you do. It starts with these so-called green energy projects. The previous government decided to ram these wind and solar farms into the backyards of communities that didn’t want them. And then — to add insult to injury — they forced hydro ratepayers to hand over their hard-earned money and subsidize the insiders who got these contracts. In fact, the Green Energy Act is the largest transfer of money from the poor and middle class to the rich in Ontario’s history. And even during the election campaign, they were still doing this — right in the middle of the campaign — with the White Pines Project in Prince Edward County. We’ve put an end to that. One of our first acts in government was to cancel 758 unnecessary renewable energy projects — and to cancel the White Pines Project. Saving $790 million for ratepayers. The Green Energy Act’s days are numbered. Thank you so much for that kind introduction and the very warm welcome. My friends, it’s great to be with you today. And it’s great to be back in the beautiful city of Ottawa. I want to start by recognizing all of the great work that AMO does in bringing municipal issues to the forefront of our government. And I want to take a moment to thank my friend, the Minister of Municipal Affairs and Housing, Steve Clark, and his staff, for their work on behalf of our government with respect to this wonderful conference. I am a huge believer in having an honest and open dialogue with municipalities. I’m a former Toronto City Councillor myself. So I know that our municipalities are often the level of government that is closest to the day-to-day lives of Ontarians. The decisions you make around service delivery and infrastructure investments have real impacts on the daily lives of Ontario residents. And you hear from the people of your communities every day — they let you know who you are accountable to, who we are all working for. And this was certainly my experience at the municipal level. Now, we all know the City of Toronto left AMO a couple of years before I was elected. And while, of course, it’s up to Toronto and other AMO members to make their own decisions. I do think, from where I’m standing now, I think it’s a missed opportunity for Toronto not to be participating in some capacity. And there is one thing I know from my time on City Council, that I think everyone here can relate to. They will always remind you who you work for! And that lesson holds true for me in my new job. There is only one taxpayer. Protecting taxpayers was a key theme in our most recent provincial campaign. And for those of you in elected office, I am sure it will be a theme in your campaigns come the fall. We all share in an obligation to respect taxpayers and deliver services efficiently and effectively. And we must always — always — keep people first. This commitment underpins everything our government does. Quite simply — we’re for the people. Last week the Ontario legislature rose. We called the legislature back immediately after taking office, because we believed there were too many urgent priorities to wait until the fall. And you can count on us to consult with you about your priorities. We promised to tackle 21st-century crime and protect law-abiding families and citizens. So we are giving our men and women in uniform the right tools and resources they need to keep families and communities safe from crime. We are investing over $182 million in nine new Ontario Provincial Police detachments with the latest in modern policing technology. So our police have what they need to go after the bad guys. And when cannabis becomes legal in Canada, you can expect us to be ready. We will be ready with a system in place immediately that protects consumers, keeps our kids and communities safe, and undermines the illegal market. Including $40 million over two years to help you prepare for legalized cannabis. We will consult with you and — even more importantly — empower you to get this right. We will be introducing legislation that, if passed, will give each of you the ultimate say in whether you want physical cannabis retail stores in your communities. We also took action to make government in Toronto, York, Peel, Niagara and Muskoka more efficient with the Better Local Government Act. And while you have the details about that Act, let me tell you that we are excited about what this law will do — saving taxpayers $25 million and improving decision-making across the city. And the feedback we are getting from the people on this move has been overwhelmingly positive. I occasionally get asked if I have plans to introduce a similar law here in Ottawa or elsewhere in the province. I would say that many of Toronto’s issues are specific to Toronto, which is still governed by its own act. And as for the other regional municipalities — what these four have in common is that the Liberals imposed these new elected regional chairs in 2016. The last thing any municipality needs is yet another layer of elected politicians. That’s not how you make better decisions. So these were unique situations. And no — we do not have plans for similar legislation in our future. What we are doing is partnering with you. As I’ve travelled across Ontario, I’ve spoken to countless mayors, councillors, wardens and other representatives. And it doesn’t matter if I am in Kenora or Cornwall — I hear similar things time and time again. You want a provincial partner that listens to your needs and the needs of your communities, instead of the insiders and the lobbyists. A partner that helps you bring investment and good jobs to your communities. A partner that cuts through the red tape and gets things done. And we’ve already acted to create and protect jobs in Ontario. We’ve protected the 7,000 jobs that depend on the Pickering Nuclear Generating station. We’re also going to reduce the tax burden on businesses to attract investment and jobs across Ontario. And we’re going to do whatever it takes to stand up for local Ontario jobs — no matter what happens in the trade dispute between the federal government and the United States. For instance, we promised to get Ontario moving faster than ever before. That means money to help them get major transit projects up and running. That means getting our highways and roadways back into shape for the millions of families, workers and businesses who use them every day. And we’re going to make driving on those highways cheaper by reducing the price of gas by 10 cents per litre. When I was sworn in as Premier, I said that this government would never forget who put us here: the people. The people of this great province have trusted us to keep our word, and work tirelessly each and every day on their behalf. For years, the people of Ontario have struggled under fiscal mismanagement, record levels of debt, and crumbling infrastructure. Like a phone call from someone in your community, asking for your help. We’re going to continue to listen to the people. We will work hard with you — because you are closest to the everyday needs of the people. And together we will make this province better than it has ever been. Ontario’s Liberals lost official party status in the recent June 2018 vote for the provincial elections, under former Premier Wynne’s leadership. Energy policies and rising electricity rates were a hot button election issue. Everybody loves renewable energy, right? That’s what surveys tell us with global support for renewable energy consistently polling above 80 percent. But don’t tell that to the people of the Province of Ontario, Canada. On June 7, the electorate handed a stunning defeat to its Liberal Government after 15 years of reign. The election winner: Conservative Doug Ford, brother of Toronto’s infamous crack-cocaine smoking mayor, Rob Ford. The issue in the forefront of voters’ minds: sky high electricity prices. Ever since the Ontario Government invoked its Green Energy Act in 2009 to transition away from coal power to wind and solar energy, electricity prices have risen a whopping 75 percent. In Ontario, electric bills have become as frequent a topic of water-cooler conversation as apartment rents are in Manhattan or San Francisco. An allowance of five years after FIT contract execution for facility construction, creating windfall gains for developers as equipment costs declined while preventing ratepayers from participating in any of those savings. How did Ontario get their renewables policy so wrong? ◾Sombra, a 20-MW solar energy generating facility.